Of Temples, Scrolls and buried Treasure. At any time, in almost any field or discipline, there will be an orthodoxy, and there will be the heretics; people who challenge the orthodoxy in some way or another. Biblical archaeology is no exception. This article will introduce the ideas of not one, but two such heretics. The reason for doing this is to show that, by bringing their ideas together, some intriguing possibilities begin to emerge about what may have been happening during the reigns of Saul, David and Solomon. This may, amongst other things, cast new light on the building of the temple by King Solomon 3000 years ago. Before considering the ideas of these contemporary heretics, I want to go back 3000 years to an Egyptian heretic. In the sequence of Egyptian Pharoahs, Akhenaten, or Amenhotep IV as he was originally known, is clearly unique for a number of very specific reasons. While the Pharoahs before and after him were happy to continue with the worship of a whole panoply of Gods, Akhenaten attempted to initiate a major reform and transform the Egyptian religion to by the worship of a single God. This God was Aten, one of the existing Egyptian Gods, which was represented by the Sun disk. Akhenaten promoted him to the position of supreme God. The other Gods even Amun, the ‘King of Gods’ were relegated and ultimately totally erased, often literally as can be seen by the mutilated hieroglyphics on their temples. Thus began the Egyptians brief experiment with monotheism. To make the transition complete, Akhenaten constructed a whole new city and Temple at Akhetaten/Armana so that they could move away from the relics of the previous Gods at Thebes. His change of name was also deeply symbolic, Akhenaten means ‘Glorious spirit of the Aten’. This all raises many questions. In particular what were the events or influences that might have caused Akhenaten to make such a dramatic change? The orthodox Egyptian Chronology based largely on the original dating proposed by Champollion puts Akhenaten at approximately 1350 B.C.E Approximately 100 years before Ramesses II, the Pharaoh traditionally identified with the Oppression of the Israelites and the Exodus. This suggests the possibility, which Robert Feather argues, that Akhenaten influenced the Monotheistic religion of the Israelites who would have been in Egypt at the time, who developed a Hebrew version of the Egyptian religion. Some weight to this hypothesis comes from the fact that there is an inscription found in Akhenaten’s temple to Akhetaten which is remarkably similar to Psalm 104, hinting at some cross fertilisation at some stage. There is also the possibility that the influence went in the other direction. However, there is little else to connect the two, so this is not generally considered a serious possibility. It is now time to introduce the first of the two contemporary heretics, namely David Rohl. David has proposed that the conventional chronology of the Pharaohs should be shifted by 300 years or so. The reasons for suggesting this are covered in extensive detail in ‘A Test of Time’. He is not alone in suggesting that such a shift is required, with a number of other archaeologists suggesting that some realignment of the dates in this direction is required to make more sense of the archaeological evidence. One of the implications of this proposal is that the period when Akhenaten was Pharaoh moves forward about 300 years and now lies between 1022 B.C.E and 1006 B.C.E. This is 200 years after the Exodus and probably right in the middle of the reign of King Saul on David Rohl’s revised chronology. Continuous lines represent the periods when the named individual was Pharaoh or King. The vertical dashed lines indicate the periods when Akenaten and David were alive, showing they were roughly contemporaries. This creates a completely different set of circumstances to explore in order to find possible reasons for Akhenaten’s rejection of the old religious ideas and introduction of monotheism. David Rohl considers in some detail the implications of introducing his new chronology. For example, in 1887 a series of clay tablets were found in Amarna in Egypt which record correspondence between Akhenaten and Kings of neighbouring kingdoms. Until now it has not been possible to identify these neighbouring Kings from other contemporary records. 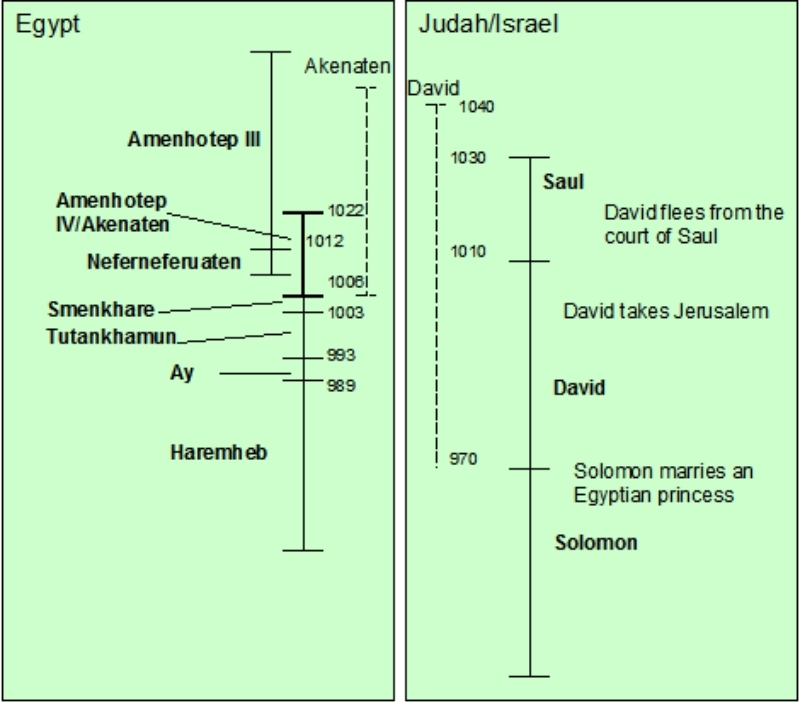 However, the new Egyptian chronology would mean that one of these Kings is the biblical King Saul. In the Armana letters, the leader is referred to as Labayu or ‘Great Lion’. David Rohl argues that this was Saul’s contemporary name, rather than has subsequent legendary name. This might explain the reference to lions in Psalm 57 v4. which, in context, would refer to Saul’s bodyguards. We will return to these letters later, but at this stage it is sufficient to note that this is evidence that the relationships between the Kingdoms were such that diplomatic exchanges could take place. This may possibly be an indication that conditions were right for exchange of other ideas as well. It is certainly true that Akhenaten introduced a radical change in Egyptian art which looks to be very likely to be as a result of foreign influences. It is also know that Akhenaten appointed a vizier called Tutu, which is an Asiatic name, possibly from Judah. To appoint a non-Egyptian as a vizier was extremely unusual, and an indication of Akhenaten radical approach to things. To have a vizier from Judah is perhaps even more significant. When looking for what might have influenced Akhenaten to make his changes it is important to realise that these changes must have started almost as soon as he came to power. He only reigned for 16 years, he changed his name after only a couple of years, and the new temple and city was completed after 12. The influences are therefore likely to be found in the period immediately before he came to power. This corresponds to the first half of the reign of King Saul, when Judah was developing into powerful Kingdom. It is possible that this prompted Akhenaten to look closely at the Monotheistic religion practised within Saul’s Kingdom, in order to understand more about what was happening there. If he was not already aware of it, he would have quickly realised that Saul’s people were the heirs of the monotheistic religion practised by the Israelites who had left Egypt 200 years ago, amidst a significant demonstration of the power of this people God. Again, this might have given Akhenaten more reason to look closely at what lay behind these people. It should be noted that relations between Saul and the Pharaoh (probably Amenhotep III) were not always friendly. In Armana tablet EA 252 Labaya (Saul) warns the Pharaoh that he should not interfere with his affairs. Another very important factor is likely to have been the figure of David, an extremely charismatic figure who had great influence over the people that he met. Egyptians on diplomatic missions would no doubt have met David and brought first hand reports back of this young lad who had had such an effect on Saul’s court. It is even possible that David and Akhenaten might have met, perhaps as a result of a ‘fact finding’ mission by the young Egyptian prince. Although I suspect that this would not be normal practise for a Pharaoh to travel in this way, Akhenaten was not a normal Pharaoh. Returning to the origins of Psalm 104 it is no longer the case that it must have originated in Egypt based on dating. Indeed the dating are now such that it is possible to envisage situations where this text could have originated in either Judah or Egypt. However, the psalm does fit into a much wider body of poetic literature that came from Judah, so perhaps the balance of probability is that it originated in Judah, and found its way to Egypt. Indeed, it might be that poetry such as this could be one of the factors that helped inspire Akhenaten to make the changes that he did. It is certainly the case that artistry in all forms was very important to Akhenaten. However, whatever the influences, the Monotheistic religion introduced in Egypt when Akhenaten came to power was not a simple transfer of the Judaism. This may be because there were other influences at work, or it may be as a result of pragmatism on Akhenaten’s part. He would have known that such a change would be difficult, and so he chose to ease the change wherever possible, for example by making his new God ‘emerge’ out of the existing Egyptian God Aten. This is a process repeated many times in history, where, deliberately or inadvertently, components of a previous religion become incorporated into its successor. The Christian celebration of Easter contains many components of the religions that it supplanted. If Saul and David influenced Akhenaten, then events in Judah immediately after Akhenaten came to power may have proved crucial. Almost exactly at the time that Akhenaten came to power and started his reforms, David fell out of favour with Saul, and had to retreat into the hills, pursued by Saul. The country whose God had so influenced Akhenaten was now in civil war. If David Rohl is right then we have direct evidence that Akhenaten was fully aware of these events. In this context, David Rohl believes that the Habiru are the Hebrews, the band of followers led by David who are hiding up in the hills. The parallels with Saul’s son Jonathan’s association with David (1 Samuel 20:30-31) are clear. It is intriguing that this text implies that Saul found out that Jonathan was fraternising with David as a result of a letter from Akhenaten, implying that Akhenaten was aware of what was going on in Judah in some detail. Maybe we are seeing some evidence of the role of the vizier Tutu. It is unclear however why he should therefore be handed over to the commissioner. If he was handed over, he must have returned in that he later died with his brothers in the battle of Gilboa. Is it possible that seeing the country and individuals who were the source of his inspiration descend into civil war cast some doubts into Akhenaten’s mind as to the changes that he was making? David Rohl makes a strong case for the Armana letters being a relatively detailed record of subsequent events, including Saul’s defeat at Mount Gilboa. There are then letters to Akhenaten from various chieftains recording the threat from the Habiru (Hebrews) in the mountains and asking for Egypt’s assistance to defend themselves from them, which is notably not forthcoming. This may be largely explained by Akhenaten’s unwillingness to get involved as he was occupied at home with other matters. Could another factor be the knowledge that this band of Habiru was led by David, who had partly inspired him to start his religious reforms? Another point to note is that in David’s seven year campaign leading to the taking of Jerusalem, he did not take any cities which Egypt laid claim to. This may largely be explained by the fact that he would not wish to tangle with the local superpower. Perhaps another factor could be the personal relationship and theological ties between David and Akhenaten established a decade or so earlier? The rise of David, the fall of Akhenaten. At this point two major events would appear to coincide. David’s capture of Jerusalem marking the final establishment of his kingdom, and the fall of Akhenaten. In Egypt, it quickly becomes clear that Akhenaten’s changes were not permanent. Perhaps there were too many vested interests in the previous religious structure. After the short reign of Smenkhare, Akhenaten’s changes are dismantled during the reign of the puppet King Tutankamen (originally named Tutenkaten) certainly largely under the influence of his advisors and generals. Subsequently Haremheb one of the generals becomes the next, non-dynastic, Pharaoh. A new phase has begun. However, historical antecedents would tell us that Akhenaten would not have been alone in wanting to make the changes that he attempted. Almost certainly, others would have been influenced in the same way, and no doubt many more were carried forward by his reforms. Again, antecedents would indicate that they would want to carry his new religious practices forward in some form afterwards, perhaps in some clandestine way. It is very likely that there would be members and associates of Akhenaten’s court who would have been involved as the original changes would appear to have originated from the court. Remarkably, it is possible that we have three independent relics of this phase of the story. In 1 Kings 3, v1 we are told that King Solomon made an alliance with Egypt at the start of his reign, and married the Pharaoh’s daughter. In David Rohl’s new chronology, the Pharaoh would be Haremheb. David Rohl notes that as a more pragmatic non-dynastic Pharaoh, who was less burdened by a sense of dynastic purity he was more likely than many to allow his daughter to marry a foreign King. There is another intriguing possibility, in that she would have been exactly the sort of person, at the right age, and position within the ‘chattering’ classes, to have been a clandestine adherent to Akhenaten’s new monotheistic religion. The similarities between the monotheistic Atenism and Solomon’s religion would mean that she would be much more able to fit in and be acceptable within Solomon’s court, and would explain why she would appear to have continued to be a very important figure, also mentioned in II Chronicles 8:11. David Rohl believes that her palace that is mentioned in 2 Chronicles can be identified with the Egyptian style building excavated within the Ground of the Ecole Biblique. Unfortunately, there is little to identify the theological leanings of its former occupant. However, perhaps the existence of the Egyptian Princess, accepted within Solomon’s court, is the first of the three echoes of Akhenaten’s changes. Robert Feather and Solomons temple. It is now time to introduce the second of the two contemporary heretics, namely Robert Feather, the author of ‘The Copper Scroll Decoded’. (HarperCollins, June 2000). There is a striking similarity between the plan of Solomon’s temple as described in Kings and also from the archaeological evidence, and the plans of Akhenaten’s new temple to Aten. The locations of the treasure described in the copper scroll found amongst the Dead Sea scrolls seem to tie in closely with locations in and around Akhenaten’s new city and temple. How did the plan of Akhenaten’s temple come to influence the design of Solomon’s temple 300 years later? How did the records of the treasure buried in Egypt come to be in the hands of the Jewish priests in Israel? The first question arises out of the conventional Egyptian chronology. David Rohl’s new chronology would mean we only need to bridge a gap of about 20 years between when Akhenaten’s temple ceased to be used and the building of Solomon’s temple. Could it be that as well as the princess finding her way into Solomon’s court, there were others who arrived with her from Egypt who were more than happy to see this new temple built in the pattern of their previous temple. Indeed, perhaps they could also provide the architectural and structural skills required to make Solomon’s dream a reality. Certainly, a construction of this scale was a radical departure for the Israelites, and Solomon was clearly happy to use resources and expertise from wherever it was available (1 Kings 5 to 7). Indeed the Egyptian influences appear to be recorded in 1 Kings 7 v 7 and 8, where it was noted that the court of Justice, the Palace, and the palace for the Pharaoh’s daughter were ‘similar in design’. The archaeological evidence would appear to indicate that Pharaoh’s daughter’s palace incorporated Egyptian features. If this was the case then it would seem quite probable that the Egyptian princess herself would have been intimately involved in the process of specifying the temple. But what of the copper scroll? For personal gain, so that those in the know or their descendants could retrieve them and benefit from them in the future. To keep the treasures from the heretics who were destroying the temple, perhaps to prevent them from being used in the building of temples to the ‘false’ Gods, and perhaps even in the hope that one day they could be used in the rebuilding of the temple to Aten. While it is not possible to rule out the first option, the careful preparation hints at the work of a significant number of people, who are more likely to be motivated by religious, rather than personal motives. It does appear however that Akhenaten’s reforms did effectively disappear without trace within Egypt. It is perhaps possible that by the time of Solomon it was certainly becoming clear that the information about the location of the treasure was no longer safe within the dwindling band of adherents within Egypt. Perhaps they thought that this information would be safer out of the country, held securely by people who were still adherents to Atenism. So, along with the princess, and the plans for the temple, went the map of where the treasure was hidden, perhaps leaving no record in Egypt itself. The biblical account seems to show that the princess became a key figure in the court. It is quite likely that sufficient trust built up between the princess and her Egyptian courtiers who were holding the information, and Solomon’s priests, that in time the scroll could be passed to them for their safe keeping in their private archives. There it would appear the scroll remained. It, or subsequent copies must have been taken to Babylon during the exile, and then returned to Jerusalem. During the political and religious turmoil in the first century AD, it, or a copy would have found its way to Qumran, where the community was known to be closely allied with the Jerusalem priests. Finally it became clear that the community itself was under threat, and there was nowhere safe where the scrolls could be taken so it was hidden for safe keeping, like the treasure that it described was buried, almost exactly a millennium earlier. Of course, we will probably never know. It is possible that the story would best be told through the eyes of the daughter of Haremheb. She has the unique position of having been an insider in both the Egyptian court and also the court of David briefly and then Solomon. The other ‘star’ of the drama, is Psalm 104. The young prince Akhenaten (or rather Amenhotep as he is known at this stage) becomes aware of, and arranges to meet the charismatic David in the court of Saul. Already we see that Akhenaten is different from other members of his dynasty in that he would want to arrange such a meeting and have contact with outsiders. Akhenaten meets David and they find they are kindred spirits with a progressive forward thinking view of things. Akhenaten is strongly influenced by David’s ideas and songs, and decides that a similar monothesistic faith to David’s should be introduced in Egypt. At this time David’s Psalm 104 is introduced as an example of the sort of thing that influenced Akhenaten. The screenplay implies that it is based on a song of David, but Akhenaten makes contributions. As the time when Akhenaten is becoming close to being Pharoah, and will be able to put his ideas into action, we see things are going wrong in the court of Saul. The Drama would play out the contrast between the crowning of Akhenaten with the expulsion of David from the court of Saul. Akhenaten sets about introducing the new monotheistic worship religion within Egypt. He maintains formal links with the court of Saul, who asks Akhenaten to help fend off the raiders in the hills, which are of course led by David. Saul is unaware that Akhenaten is also keeping links with David. This would be through his Hebrew vizier TuTu, who may be shown as being associated with David. Akenaten’s new temple is opened. Akhenaten’s Psalm 104 is used in the opening ceremony. The old guard in Egypt start working against Akhenaten and his new ideas (probably because they have lost many of the benefits that went with the old religious practices). We meet one of them, the young Haremheb, a junior officer with ambition. Akhenaten receives news of David’s victories as it becomes clear that things are not going well for him at home. The old guard (including Haremheb who is working his way up the ranks) are able to have more influence over the weak Tutenaten. They arrange to reintroduce the old religious ways. Tutenaten is renamed Tutenkamen.. However there are still those who remain true to the old ways, and continue to meet in the temple to Aten. About 20 years later the daughter of Haremheb gets involved with the small number of followers of Aten and the monotheistic religion. Initially Haremheb is not aware of this, then becomes aware, causing tension, Haremheb is caught between wanting to erase all memories of Aten within Egypt and love of his daughter, a follower of Aten. Haremheb comes to power as the new Pharaoh. Very much a pragmatist, he maintains links with the powerful court of David. The daughter of Haremheb meets Solomon during diplomatic mission to the court of King David. She recognises the links between her worship of Aten and the faith of David and Solomon. Perhaps this starts when she overhears Psalm 104 being sung. The daughter of Haremheb convinces her father that it would be a good political move for her to marry Solomon. Haremheb half suspects that there is something else going on, but is prepared to go along with this as this suits him for political reasons, and gets rid of his troublesome daughter. Message is sent to Egypt asking for the services of specific architects. The architects arrive, there is a tearful reunion and the Temple is built. The princess is not allowed to the opening of the temple for religious reasons. She watches the formal opening of temple from her Egyptian style palace on the hill. She hears sound of Psalm 104 being sung as part of the opening ceremony. She has kept copper scroll secret all these years. On her deathbed she tells a priest about it. He takes it and puts it into the priest’s secret archive. We see that this priestly archive, including the copper scroll is passed down from high priest to high priest over many years. The Qumran community become keepers of the archive, as they are seen by the priests inner circle as the only true and reliable keepers of such things. About AD 70, at the fall of Jerusalem and Messada, the Qumran community see that they are under threat. They decide to hide their scrolls, including the copper scroll in caves. This would be shown in a way that echoes the hiding of the treasure in Akhenaten’s temple 1000 years earlier (Use psalm 104?). 2000 years later a shepherd boy finds the dead sea scrolls. We see the copper scroll in the cave where it was placed 2000 years earlier. Finally we move to a shot of the copper scroll being opened out in Manchester. We hear the sound of Psalm 104 as used in the Akhenaten/Solomon sequences as background music, which then melds into the Psalm being sung to a contemporary setting that has clear echoes of the setting that was used in the earlier sequences. The camera moves to nearby church where it is being sung.